In the early hours of the 24th of April, Did he say Jump [JMP-N] and allies clashed with Local Is Primary [CTRLV] and its allies in the Bleak Lands region, fighting over a tower in the Kamela system in two bloody engagements. Once again, Local Is Primary reinforced Did he say Jump’s tower in Kamela. As the tower was exiting reinforced mode, both sides formed for another bloody battle in a long series of confrontations fought between the two in the last couple of weeks. Did he say Jump with its allies in FETID [FETID] and the Gallente militia formed a mixed armor battleship\strategic cruiser fleet, estimated at nearly 100 pilots. The force gathered in Kamela in preparation for the fight. Local is Primary and its allies gathered an armor battleship fleet of their own, numbering approximately 140 pilots, though accounts from combatants vary. The force made its way to the system, warping to the tower itself in order to set up and wait for Did he say Jump and its allies to unduck. However, as they were doing this, Local Is Primary’s fleet was forced to retreat from the tower grid, as the tower’s defenses proved too powerful to tank. The fleet warped to the Kourmonen gate, jumping into the system and being pursued by the Did he say Jump forces. As the Local Is Primary force uncloaked and started setting up on the gate, Did he say Jump’s forces jumped in as well, and the two sides clashed, started the fight on the Kamela gate. The battle was a brutal exchange as both sides slugged it out at close range. The two fleets were in disarray, having jumped in one after another, and their respective logistics wing were still scrambling into position. Friendly and hostile ships were separated by only a few kilometers of space. This gave an initial advantage to Local Is Primary, who had many Bhaalgorn battleships on its sides. The heavy energy neutralizers of the Bhaalgorns soon drained the Guardian logistics cruisers of Did he say Jump, shutting down its logistics wing and allowing the battleships to start and tear up the now defenseless ships. 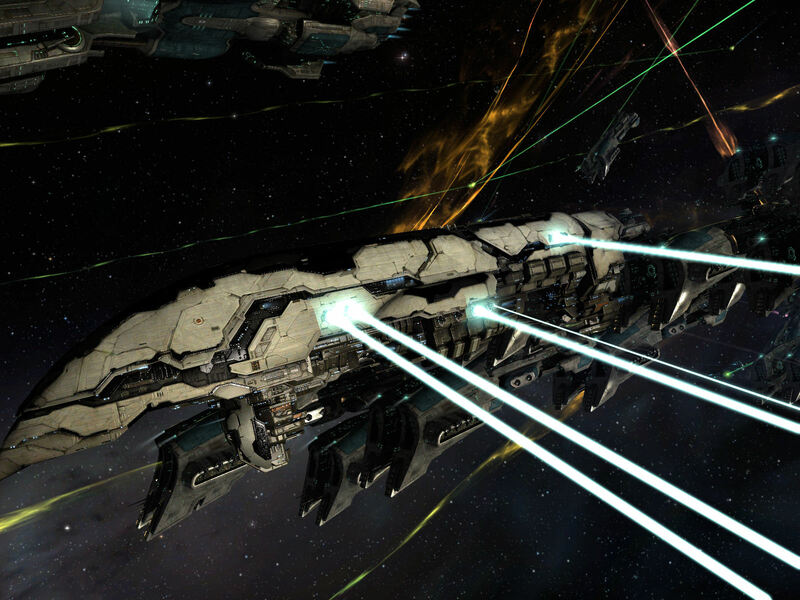 Did he say Jump retaliated, targeting the Bhaalgorns and pouring its fury on the battleships. It helped that it fielded mostly Machariel battleships and strategic cruisers, who hold advantage in close quarters fight, specifically the fearsome 800mn repeating cannons which tore apart the Local Is Primary’s Bhaalgorn battleships. In order to augment its failing logistics wing, triage carriers were called in to help Did he say Jump. The carriers jumped in from Kamela itself, but found themselves scattered around the gate. Regardless, with the triage carriers on the field, Did he say Jump was prepared to continue and fight. Local Is Primary switched its focus from the Guardian logistics cruisers to the carriers themselves, but was unable to tank the incoming damage. Concentrating on one of the triage carriers, the battleship fleet was able to overwhelm the ship’s defenses, tearing through its armor and finally dispatching the capital ship. However by now it suffered severe losses, its own logistics wing severely hampered by a large amount of electronic warfare possessed by the Did he say Jump’s fleet and the loss of a logistics anchor during the opening minutes of the fight. Whats more, Did he say Jump command destroyers started picking off mainline ships, separating them from the main fleet and making them an easy prey for the Did he say Jump’s main force. Realizing it was a losing situation, Local Is Primary’s fleet commanders made the decision to retreat, allowing Did he say Jump to claim the field. Yet, it was clear for both sides that the fighting was far from being over. Though Local Is Primary was forced to withdraw, it was not beaten yet, and planned to return to the field. Did he say Jump was aware of this, and retreated back to Kamela, setting up on its tower and deploying cynosural inhibitors as it guarded its triage carriers who worked on restoring the tower’s shields. After replenishing its losses, Local Is Primary returned once more, jumping into the Kamela system and aligning towards the tower itself. With Did he say Jump having the commanding position on the tower and near its triage carriers, Local Is Primary sent a wave of command destroyers first to disrupt its fleet, managing to teleport most of it away from its logistics wing and triage carriers. As the surprised defenders started burning back towards the carriers, Local Is Primary’s fleet was already in warp, landing 30 kilometers away from the displaced Did he say Jump’s mainline ships. A second battle flared up as the two sides exchanged fire again. This time Local Is Primary was able to inflict greater damage, catching several strategic cruisers and battleships outside of remote repair range as the scattered defenders burned back towards the carriers. Did he say Jump’s logistics wing raced towards the fleet in order to catch up as Local Is Primary continued to pummel the now defenseless ships, giving chase. The defenders returned fire, focusing mainly on clearing electronic warfare ships before switching to the Local Is Primary battleships. As the two sides anchored up and continued to fight at close range, the death toll climbed as ships on either side were simply volleyed by the combined firepower each fleet possessed. The fleets continued to trade ships, though as time wore on and the amount of wrecks on the field multiplied it became quite clear that Did he say Jump was winning the exchange. With every loss, its fleet was able to destroy 3, 4, sometimes even 5 mainline ships of Local Is Primary. Whats more, Local Is Primary found itself hammered hard by the tower’s defenses as the Did he say Jump gunners focused the enormous stationary weapons on the battleships, volleying them one by one. With losses increasing, Local Is Primary found it harder and harder to break the tank of the Did he say Jump ships as its damage output severely diminished. Finally, Did he say Jump managed to tank the incoming damage while continuing to dish out punishment as the Local Is Primary fleet broke. Slaughter was not an option, and Local Is Primary retreated from the field for a second time, allowing Did he say Jump and its allies to claim the field again. With the field secured, Did he say Jump and its allies restored the tower’s shields before departing once more, winning the objective as well. With this, the fight over the Did he say Jump’s tower in Kamela came to an end. Battle report for the Kourmonen and Kamela systems can be found here. All told the battle on its two parts lasted 25 minutes, with the two systems seeing an estimated 250 pilots at the height of the fighting. Time Dilation was not reported as a factor by either side. Did he say Jump and its allies lost a total of 23 ships in the fight, including 1 carrier, 6 battleships and 4 strategic cruisers for a total of 12.06 billion ISK damage. Local Is Primary and its allies lost a total of 73 ships in the fight, including 46 battleships and 7 strategic cruisers for a total of 27.02 billion ISK damage. You actually make it seem so easy along with your presentation but I to find this topic to be actually one thing which I think I might by no means understand. It sort of feels too complex and very wide for me. I’m looking forward in your subsequent post, I’ll try to get the hang of it! You actually make it appear so easy together with your presentation but I find this topic to be really something which I feel I might by no means understand. It seems too complicated and extremely huge for me. I am looking ahead in your subsequent publish, I will try to get the dangle of it! I like Facebook, however I dislike that their notes area isn’t as enticing as MySpace’s blog sites. I’ve lately moved a blog site from MySpace to Facebook making use of the “share” symbol situated below each blog site … Nevertheless, I do not like the means it shows up on my Facebook page. Are there any kind of much better ways to import my blogs?. You can certainly see your expertise in the work you write. The arena hopes for more passionate writers like you who are not afraid to say how they believe. Always go after your heart. “Billy Almon has all of his inlaw and outlaws here this afternoon.” by Jerry Coleman.